A friend, Selwyn, posted in his fb wall about this news report. I am not "yellow", not red, not blue, not black, not white, etc. I don't care much about politicians, political parties, NGOs, individuals who are non-advocates of limited, minimal government. 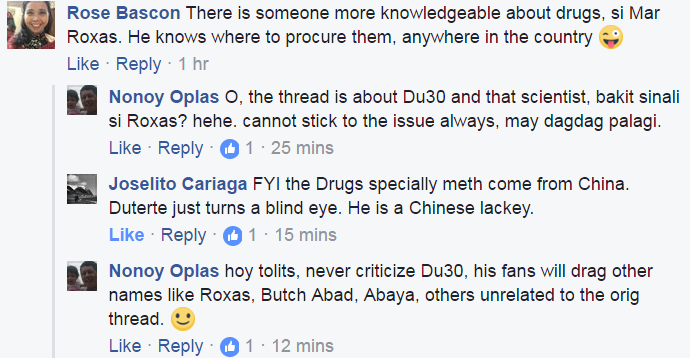 Many Du30 fanatics have that low-life attitude that if you are not with them and their idol, then you are a "yellow" or 'pro-drug criminals" and related insinuations. Lousy minds. Rose posted this in one fb group of which I am also a member. 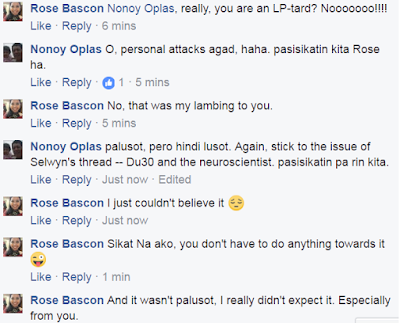 Nagsumbong si Bascon, pero kulang ang kwento, hehe. 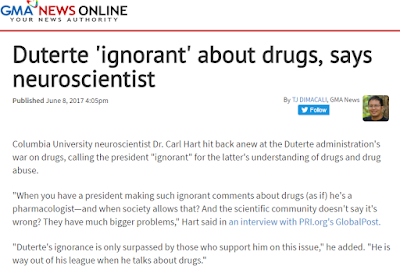 Simple thread posted by a common friend -- on Duterte and the US neuroscientist who attacked Du30. See the hijack of thread? 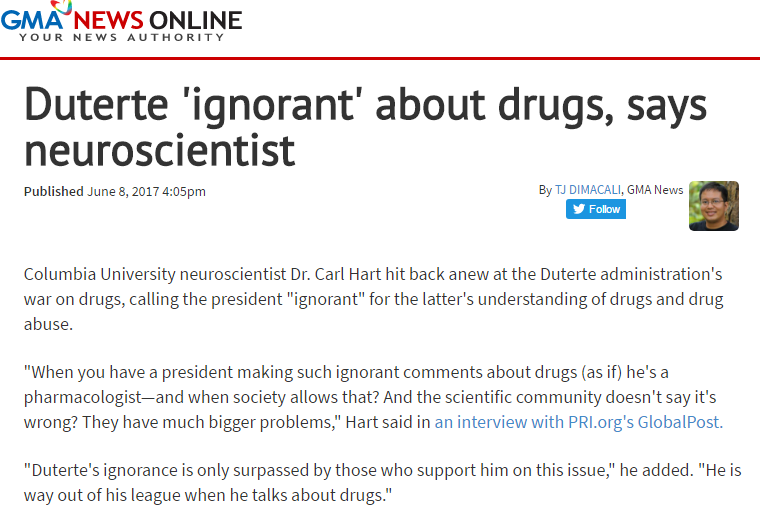 Original topic is Du30 vs the neuroscientist who criticized him. 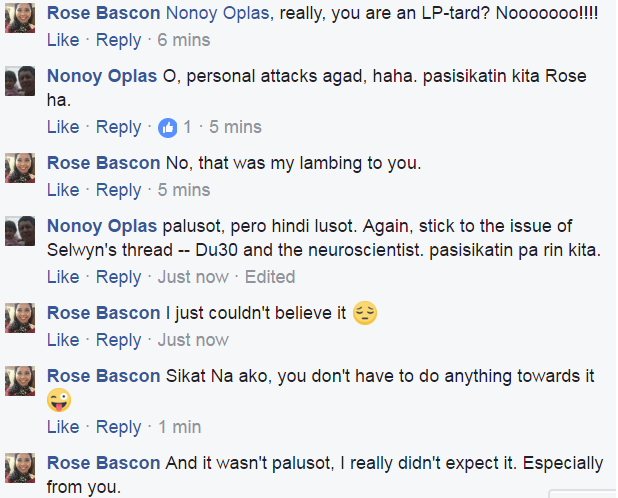 Digression #1 turned to Roxas; digression #2 turned to LP-tard and me; #3 reiterated it’s now me as the issue. Nope, I did not get angry, I made fun on the hijack and digression of thread. See also her language: “LP-tard”, “libtard”, indicator of someone unable to stick to the original issue and expand the digression to sloganeering and personal attacks. 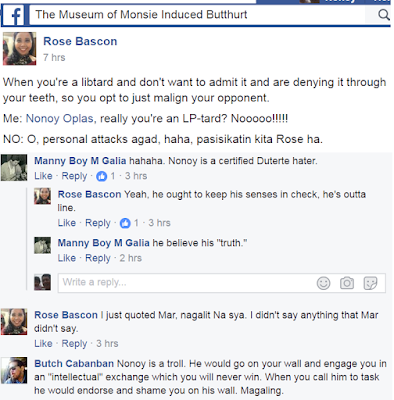 About the comment of Manny “Nonoy is a certified Duterte hater”, haha, hoy Manny, not 100% naman. I support Du30’s questioning the Paris Agreement on the climate drama, he was 99% correct there. I also support his build-build-build program, but not his shift from PPP funding to ODA (especially China loans) of massive infra. About the comment of Butch C, the guy joined the fray from an ignoramus perspective. “He would go on your wall and engage you…” Wrong. 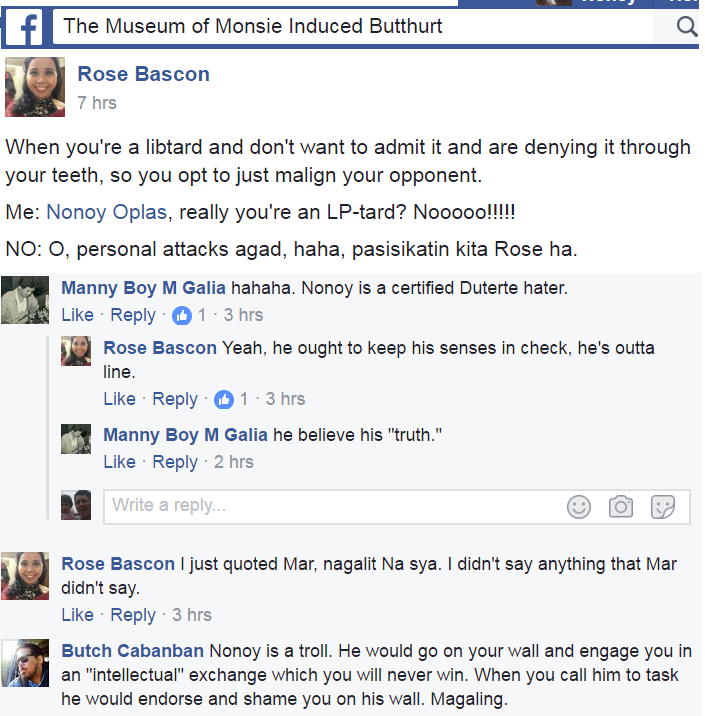 I did not go to Rose’s wall, we are not friends, I don’t even know her except that she’s also a fellow UP alumni. We debated at a mutual friend’s wall. “he would endorse you and shame you on his wall.” Wrong, I did not post that debate, not even mentioned it in my wall. Many Du30 supporters and fanatics, uhrmm, do lots of strawman arguments. Pathetic.